(Newser) – Members of a book club out for a ride through California wine country say they endured a "humiliating" experience Saturday when they were kicked off the Napa Valley Wine Train, the San Francisco Chronicle reports. The women from the Sistahs on the Reading Edge club—10 of them black, one white, per the Napa Valley Register—say they were racially targeted for laughing and talking too loud. "It was humiliating," Lisa Johnson tells the Chronicle. "I'm really offended. ... I felt like it was a racist attack on us." Johnson, who posted photos on Facebook, says members of her group, all seated adjacent to each other on the 18-mile ride, may have been "rambunctious," but they weren't "obnoxious or intoxicated." In fact, she notes, several passengers befriended them—except for one woman pointed out in one of her Facebook photos, who reportedly told the group "this isn't a bar." Doodah clownin in da ghetto Sista. 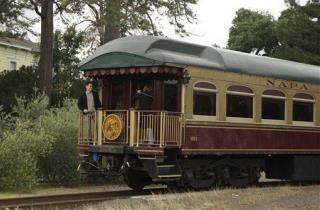 Everyone but 12 people had an enjoyable excursion on the Napa wine train? Un-newsworthy this. Move along, nothing to see here. Well there's another way to look at this, that they did rely on race to make the decision to kick the women off the train and as soon as it is pointed out, then it's countered that they are playing the race card. But I would beg to differ. If they relied on the women's race, then it was they who played the race card and the women just pointed it out. Pointing out that they were kicked off the train because of their race, is not playing the race card. It's who kicked off the train because they are black that played the race card.